Because today was a rare beautiful day, I took a walk this afternoon through Oak Grove Cemetery in Medford, which is down the street from our house. 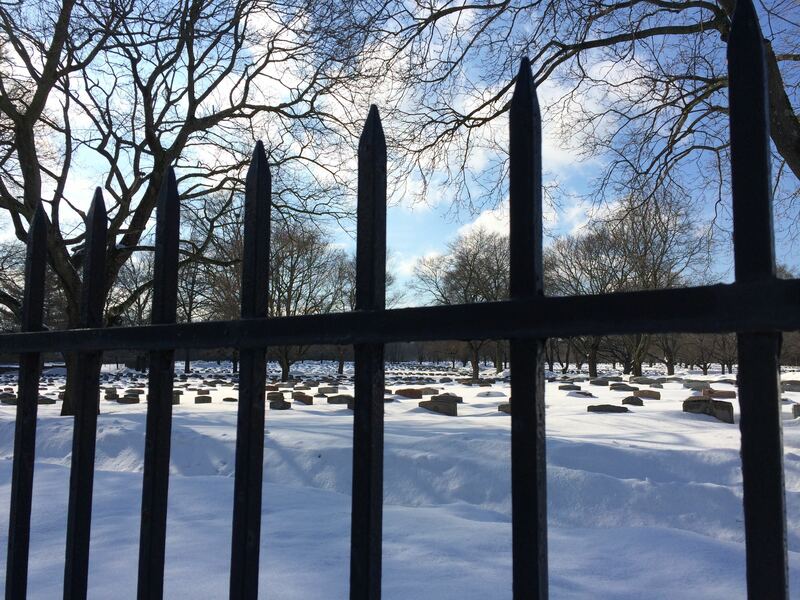 The snow was so deep that it reached up near the tops of the gravestones — an eerie sight even in the bright sunlight. All of us eavesdrop on the lives of others every day. For whatever reason, this one stuck with me. This is a really nice entry. I am glad that the weather today was milder and much sunnier than we’ve had for a long time. It sounds like it added to the couple’s lighter mood, even on a sad occasion. The pic you posted on Facebook was really stunning! Thank you, @Steve. I didn’t think it was as well-composed, but it does shows the depth of the snow more clearly. For anyone who would like to see it, here it is.